You know when that stranger approaches you in the grocery store and tells you how to be a better parent or offers you life-lesson advice? Or how about that fellow church-member who really only communicates with you in order to tell you the things you are doing wrong as a parent? Compare that feeling to the advice you get from your mother, best friend, or grandmother. We tend to take guidance and critique better from people we know and people we know love us than those we aren’t well-acquainted with. When you spend time with your children, they will feel greater love. There will be a harmony in your home, and when you offer up advice and instruction, they will react to you like you do to a good friend. They will know you love them and know they can trust that you have their best interests at heart. If you don’t spend time with them, and yet try to correct them, they may smile politely and turn around and bristle as you want to with the random stranger in the super market. Family activities do not need to be fancy, extravagant, nor expensive. They don’t even have to be “fun.” Time spent together is helpful. 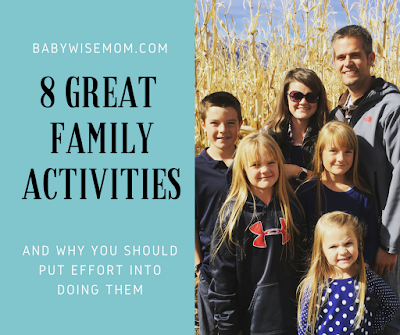 Here are some ideas for you to make sure you get that family time in–time for the entire family to be participating in an activity together. I am starting here just to show that family time really is just about time spent as a family. Doing house work or yard work all together is spending time as a family! You are all working toward a common goal and it will be time of value. This unfortunately does not mean your children will say, “Oh thank you so much for making me pull weeds this morning! This family chore time is so special!” But it will be meaningful in their lives. We try to make family chore time a bit more bearable with playing music or singing songs. We make sure we point out how great it is to have everything clean and done at the end. We will even tell them before, “All right. We are going to clean the whole house really well today. I know that isn’t fun, but it needs to be done and we need to work as a team. Let’s have a good attitude and just get it done.” It helps immensely! In case you don’t know, I love chores. Like, super love. I have a lot of posts on chores to help you out if you need ideas to get the ball rolling here. There are so many things you can do locally that are fun and free. Go for a hike. Go to the park. Have a picnic somewhere. Go to the beach. Go for a walk. With nice weather, we often go for a family walk on Sunday afternoons. It is one of my favorite things to do all week. My children love to go to the park and all play together. My husband and I will join in a game of tag, and they find that to be so fun. There are many things you can do in the backyard. A family game of soccer. Frisbee. Playing in the sandbox. Drawing with sidewalk chalk. These are all fun activities you can do for free at home. Our kids love to do a family movie night. We all get comfortable, pop some popcorn, and watch a movie together at home. In the summer, it is fun to do it outside for some variety. One of the best activities to do as a family is go camping. You are often cut off from the world when you camp, so you can only pay attention to each other. Camping isn’t necessarily easy! I am not leaving you high and dry here. I have a bunch of posts on camping to help you do this activity smoothly. Our favorite tradition is to play a family game. We do this each Sunday and our children look forward to it. We rotate who gets to choose the game each week and the rule is you have to be a good sport and play along–this is an important rule when you have an 11 year old and a 4 year old. Ha! Look. Very few older people like to play Candy Land with regularity. My husband and I have always loved to play games, but we like some variety and we aren’t weekly Candy-Landers ourselves. So we have done some searching and finding. I have some posts on great games the whole family can enjoy. Each week, we have our family home evening. This just something everyone plans on. You can do a fun activity in conjunction with family home evening. You can read more about how we do family home evening here. A family vacation is the most expensive way to have family time. 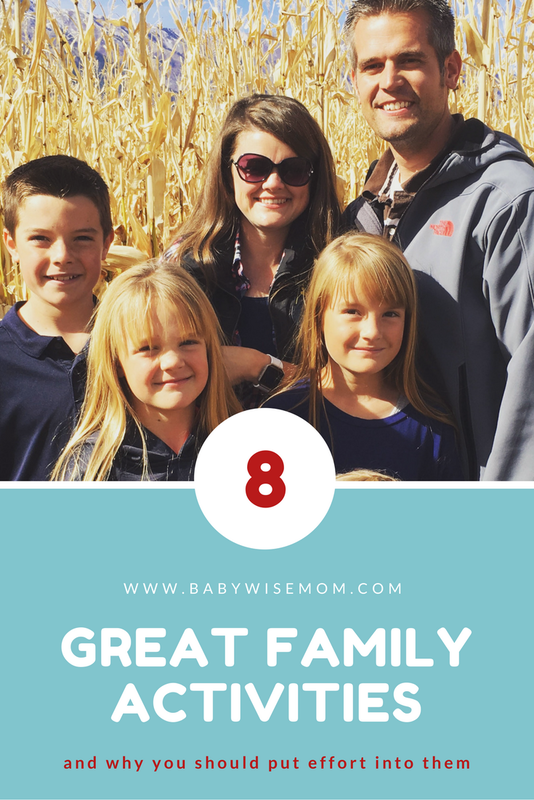 You definitely want all of the simple, cheap, and free ideas in your list and on your radar because you need family time to be more frequent than most people have time and money for with vacations. However, keep vacations on your radar, too. There is a large, concentrated amount of time spent together on vacations. You make great memories and have great stories to look back on and talk about. Whenever we go somewhere for a big trip, I write about it to help you be able to travel there with your family with success. Here are some ideas.